Turkey blocks Wikipedia as Erdogan's assault free speech continues. 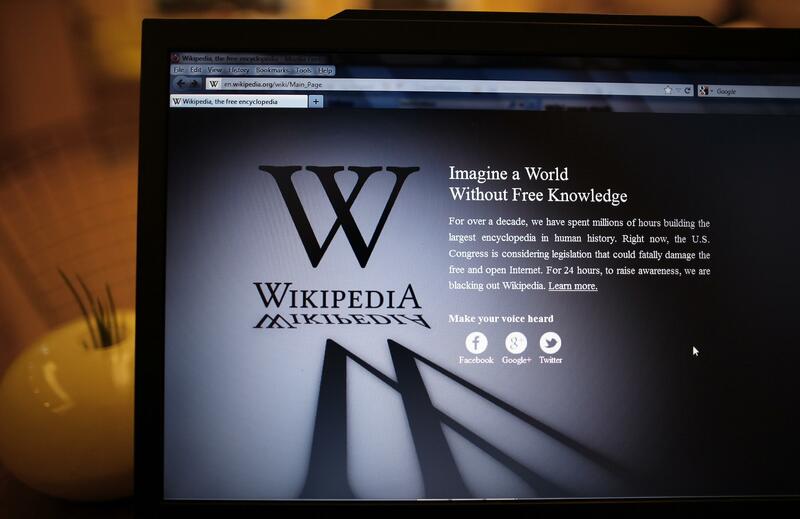 A laptop computer displays Wikipedia’s front page showing a darkened logo on January 18, 2012 in London, England. The Turkish government, known to censor social media sites in the country, blocked access to Wikipedia, a media watchdog organization reported Saturday. The government blocked the user-written online encyclopedia under the auspices of a law allowing the government to take down sites it considers obscene or a threat to national security. The state-run Anadolu news agency reported that Wikipedia was running a “smear campaign” against the Turkish government. Wikipedia refused to take down content that suggested government of Recep Tayyip Erdogan was in cahoots with terrorist organizations, according to Al Jazeera, prompting the site to be blocked temoporarily. Wikipedia “has started acting as part of the circles who carry out a smear campaign against Turkey in the international arena, rather than being cooperative in fight against terror”, ministry officials were quoted as saying. The website tried to show Turkey “at the same level and in cooperation with terror groups”, the report said. A block affecting all language editions of Wikipedia in Turkey was detected at about 05:00 GMT after an administrative order by Turkish authorities, the Turkey Blocks monitoring group, which watches internet restrictions in the country, said in a statement. The Erdogan regime is in the midst of a systemic crackdown on dissent in the country and the removal of Wikipedia, one of the most visited websites on the internet, again raises concerns about access to information and freedom of speech. Erdogan has in the past blocked a host of social media sites—including Facebook and Twitter—as well as YouTube and WhatsApp. The AK Party has accelerated its efforts to centralize power and control around Erdogan, its leader. The government has jailed dozens of journalists and shut down news organizations it considers unfriendly to the regime, citing security concerns and often leveling charges of aiding and abetting terrorism. Along with the media crackdown, Erdogan has stepped up the Turkish government’s offensive on minority Kurdish groups in the country, which it considers terrorist organizations, as well as the followers of U.S.-based Islamic cleric Fethullah Gulen. Tens of thousands of civil servants—from professors to judges and police officers—have been removed from the state bureaucracy over fears of a “deep state.” The ramshackle July 2016 coup attempt was pinned on Gulen and his followers, the Gulenists, and has been used to justify the sweeping crackdown at all levels of Turkish society.